A couple of months ago, I was asked to be the “entertainment” portion of a party here in Okinawa. And I have to say, I was a little concerned that they wanted me to do some sort of weird circus type demonstration. Luckily, that’s not what they were looking for…and actually wanted me to lead them through a brief yoga practice in the middle of their party. Okay, I thought…seems realistic. Unfortunately, I’ve been teaching yoga long enough to know that a real yoga class with a bunch of non-yogis in civilian attire (read: no yoga clothes) might be a serious snooze fest (not booze fest). Boring. I have been seeing some posts on Facebook lately and actually an article in Men’s Health about a woman in Germany who started a new trend in yoga called Bier Yoga. They are yogis that sweat through a regular asana practice, but gently sip on yummy craft beer throughout their practice. It still resembles the practice of yoga, but with a contemplative taste component. I think we all know about the yoga and wine tastings, and the yoga and beer tastings on the rise in the US. But this latest thing of actually drinking during the yoga class is a little new. So, I though ‘why not’ and figured that I would give it a go and try it out on the Japanese crowd. They always seem eager for physical comedy. So, I think I may have taken it up a notch and turned a yoga class into a serious drinking game. Not far off from your basic beer pong. I know, I know…this is yoga blasphemy and promotes an unhealthy lifestyle, blah, blah, blah. But is it really? If I recall correctly, “all work and no play makes Jack a dull boy.” Sometimes laughter is the best medicine. All things in moderation. I could go on. I’m happy to be myself and break some yogi stereotypes and not take life too seriously. Honestly, I can’t remember having that much fun teaching a yoga class. Ever. Sure, I enjoy teaching yoga and get a lot of personal satisfaction and joy out of my profession…but this was all out pure FUN. The energy level was high and the mood was infectious. Everyone had smiles on their faces for the whole 30 minutes. And it was honest fun. So, I want to share this awesome experience with my fellow teachers and tell you what the heck I did in this class. Because it’s really a stretch (no pun intended) from what a real yoga class is. Let me say that again: this isn’t a real yoga class. It merely resembles the shapes of the poses. You’ve been warned: kanpai yoga takes a party attitude, so if that’s not your style, stick to the real yoga followed by booze tasting thing. 1. Start the class with a hearty “kanpai”! (cheers in Japanese)- clank cans with your neighbor and drink. 2. Warrior 1 – both hands hold the beer up high. A high “kanpai” (and drink). 3. Warrior 2 – hold the beer in the hand reaching back and kanpai your neighbors, behind your back and in front. Drink, pass the beer to the hand in the front. 5. Triangle pose – traditional triangle pose, with the beer in the hand reaching upward. This is actually a challenge to not spill, you have to keep your eyes up on the can. Moving on to partner poses with beers! And for the grand finale…I had a contest I call “Tadasana to Savasana”. This is really fun, especially after all of that drinking. LOL. You might have noticed that a lot of the participants in this Kanpai Yoga class were drinking Red Bull (not beer) as they sponsored the event. 1. 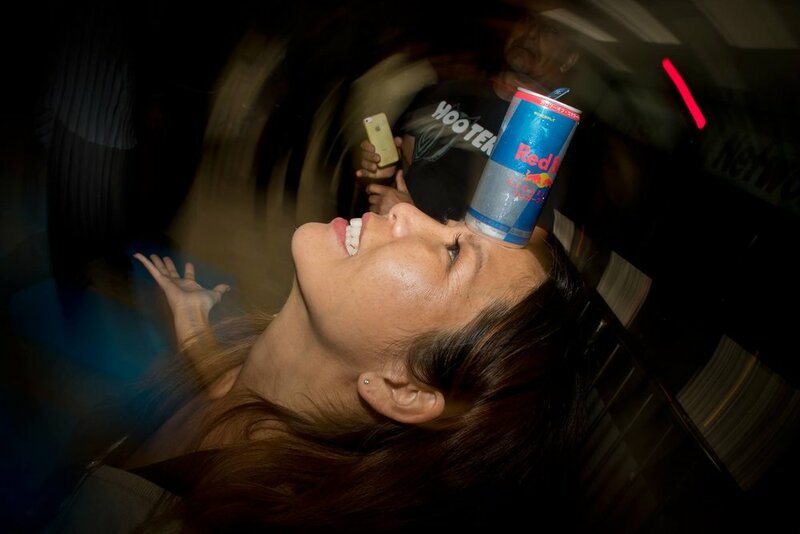 Balance a can of beverage of your choice on your forehead. 2. You have one minute to make it from Tadasana (mountain pose) to savasana (corpse pose) and back up to Tadasana again. 3. If your hands touch the can, you must start over. 4. Whoever makes it the farthest in the challenge is the winner!